Career Caddy Versus Friends And Family? It’s always intrigued me to observe the relationship between player and caddy. Undoubtedly, as with any successful partnership, there is a decent sprinkling of magic in there but just what is it exactly that makes it all work? As a player I was always firmly in the professional caddy camp, believing that a good caddy was as necessary to a player as breathing if you wanted to achieve your potential. There was no way, surely, that a family member or buddy could possibly step up and deal with the hugely pressurised arena of competitive golf, an arena that nowadays has oodles of prize money on the line. Well, take a look around you and let’s start with last weekend’s winners. 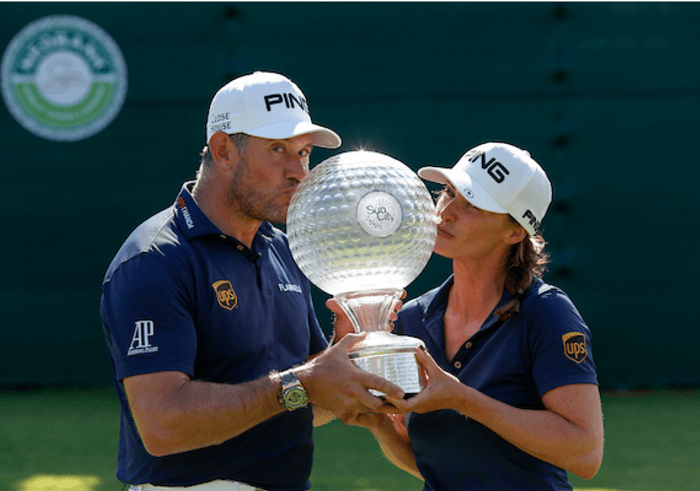 Lee Westwood rediscovered that winning feeling in Sun City at the Nedbank Challenge, his first victory since finishing top of the pile in Asia in 2015. He had girlfriend and partner Helen Storey on the bag. The last time she caddied for him, at the Made in Denmark tournament earlier in the year, he lost in a play-off. That’s a pretty good strike rate – hope she’s on a decent percentage! Now, shift your eyes westwards to Mexico and the Mayakoba Golf Classic where Matt Kuchar broke his own lengthy winless streak. Local caddy David “El Tucan” Ortiz was shouldering the clubs. “I forgot how good winning felt,” was Kuchar’s response to that most irritating, “How do you feel?” sporting question asked of any victor moments after clinching top spot. Perhaps the common denominator between these two men is they are both in their forties, both are prolific winners (although majorless) and both have accrued decades of nous and experience, knowing how to win, no matter who is on the bag. However, when I consider one of my favourite players, Padraig Harrington, the matter becomes a little more complex and perplexing. (Isn’t that always the way with Padraig?) He partnered up with brother-in-law Ronan Flood amidst a storm of criticism and in fairly short order reeled off three major victories in twelve months. Ronan subsequently became one of the very best caddies out on tour but he wasn’t at that level when the really big prizes started rolling in for his boss. And what about Georgia Hall, the young Englishwoman who is now ranked 7th in the world? 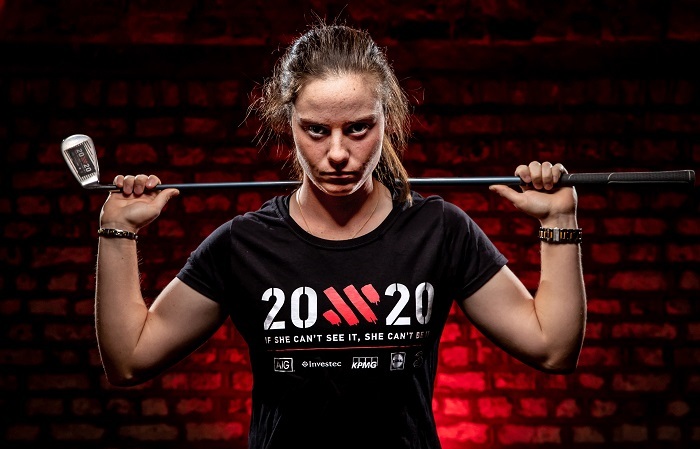 Her Dad takes over caddying duties from her boyfriend at two tournaments – the Solheim Cup, arguably the biggest stage of them all – and at the Women’s British Open which she won in emphatic style this summer at Royal Lytham & St Anne’s. Her explanation for having her father on the bag is that he knows her inside out, knows her game so well and she feels entirely comfortable with him alongside her. And what of Tommy Fleetwood with best mate Ian Finnis on the bag? That certainly works. Then, on the other side of the coin you have a player of the calibre of Adam Scott, who persuaded Tiger’s former bagman, Steve Williams, to come out of retirement to work for him at the majors. Scott wanted to win a major and felt having one of the world’s best with him was important. They subsequently won the Masters together, vindicating the Australian’s decision. After Williams totally and finally retired Scott sought out the expertise of Fanny Sunesson, erstwhile caddy of six-time major champion Nick Faldo. I walked a hole or two with Fanny as she made her final on-course preparations prior to a St Andrews Open one year. To say it was an eye-opener is an understatement. 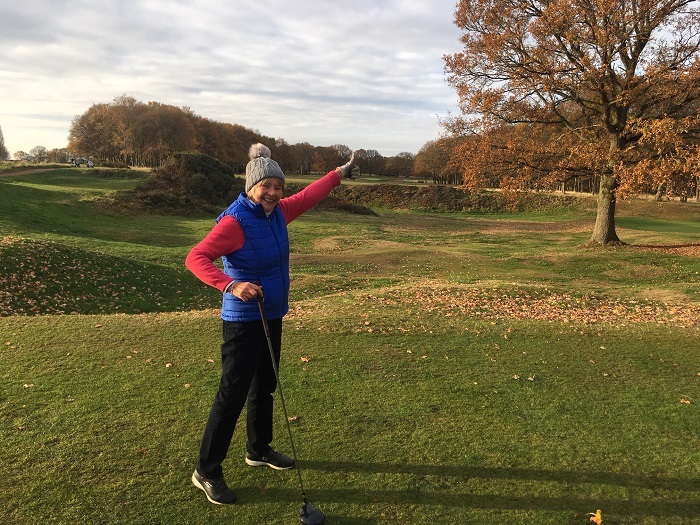 The level of detail in her work and her knowledge of the course was extraordinary and, although now no longer caddying, she is still working with current players, dispensing her knowledge and experience. Henrik Stenson considers her an invaluable member of his team, still believing he can learn from her. Another who feels her learning curve is trending upwards thanks to her caddy is Carlota Ciganda, the passionate Spaniard who plays on the LPGA Tour. Her bagman is Terry McNamara, former looper to Annika Sorenstam and Ciganda unashamedly states she is learning so, so much from him. Then there is Justin Rose, currently bouncing around between 1st and 2nd in the world rankings. He is another with a superb career caddy on the bag. He and Mark Fulcher, are a well-known, tried-and-tested partnership, celebrating their tenth anniversary this year. That’s some achievement – they are in all likelihood spending more time together than they do with their wives/partners and families. And while I’m at it….why, oh why was Fooch, the winning caddy, not given a gold medal at the Rio Olympics? But I digress. 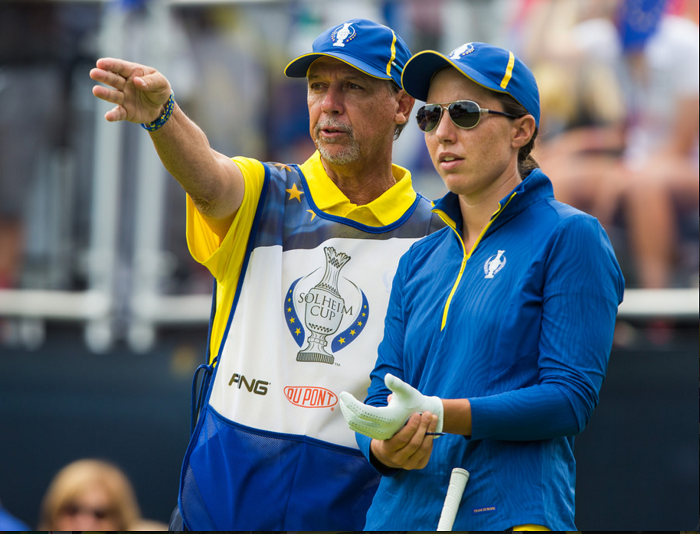 Fooch used to caddy for former US Women’s Open champion Alison Nicholas and has diligently worked his way to the very top of his profession over many, many years. There is now none better. It seems pretty obvious that one size does not fit all, as is proven by the dizzying array of partnerships on view in the winner’s circle of the world’s tours. One of the most important factors seems to be how comfortable the player is with the caddy and the extent to which the caddy knows and can read his or her player. Words are not always necessary between them and it seems to me that the importance of a caddy to each individual player depends on that player’s own point of view and requirement. Those who prefer to do things themselves will surely be more likely to turn to friends and family – perhaps they have an arrogance and self-belief that they do not need anyone’s help. This is not a criticism – these are qualities present in almost all winners and, as we have witnessed, sometimes these friends and family do become top class. On the other hand, some players believe they want the best there is on their team and will search out top men and women accordingly. To each their own, it would appear. It’ll be interesting to see which path Rory takes as his buddy Harry Diamond, who has been on his bag for a year or so, is getting ready for married life. Will Rory go down the buddy route again or search out a top-class caddy to help him stride towards those majors he so craves? If Lee Westwood sticks with Helen Storey on the bag, perhaps Billy Foster, one of the world’s best, will become available. Do you ever think there are times when it’d be really lovely to be a fly on the wall? For me, one of those times occurred a week or so back at the Irish Golf Tour Operators’ Association’s awards when they presented Wilma Erskine, club manager of Royal Portrush Golf Club, with a Lifetime Achievement Award. 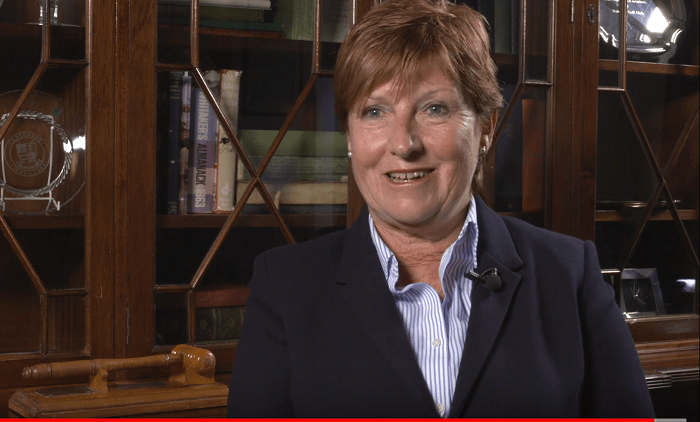 Wilma’s is a name that you will hear increasingly over the next eight months as she steers the club towards hosting the Open Championship next July, returning after a gap of 61 years. This would be a huge task for anyone, but to navigate through the extremely choppy waters of the Northern Ireland troubles to what we all envisage will be a successful staging of one of the world’s greatest sporting events is nothing short of miraculous. Wilma Erskine has been in charge at Royal Portrush for 34 years. The return of the Open Championship is an unparalleled achievement. I remember it was early to mid-1980s when a fresh-faced Wilma turned up at the club to take over the reins. Needless to say, my pals and I were all delighted, if not a little astounded, that a woman – a YOUNG woman – had got the job in such a male-dominated environment. Rumbling around in the background, however, were mutterings and harrumphings about the suitability of this girl for the job. Wilma has since told me she was very well aware that some of the older members, who were very set in their ways, subtly let it be known that they believed she couldn’t hack it and would be gone in about six months. Well, safe to say she outlasted them all. Looking back, however, it was a decision of outstanding foresight on the part of the then captain and council to make the appointment, especially as there had been a couple of short tenures immediately preceding Wilma. She didn’t let them down, but it can have been far from easy in that climate. By the time the 1990s rolled around Wilma’s vision for the club was expanding, looking ever more outwards for opportunities to put Royal Portrush on the map. And so a new era began for the club – a decade of cutting their teeth in the arena of staging top-class golf events. 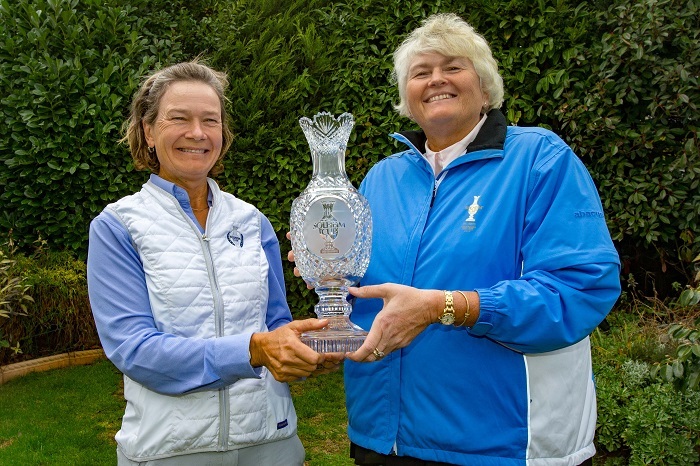 First it was the Amateur Championship, then five successive Senior British Opens. I’m not sure at this juncture that even in Wilma’s ambitious brain there were thoughts of one day bringing the Open itself back to Northern Ireland. Lessons were being learned, however, experience gained and, most importantly, relationships formed and forged with some of the great shakers and movers in the game. And you have to remember that, running alongside all of this, Wilma had to juggle the not inconsiderable task of her “day job” – running the club and keeping the members happy. Not everyone wants the upheaval of tournament golf with the attendant time-consuming activities impacting their course and their regular weekly games. 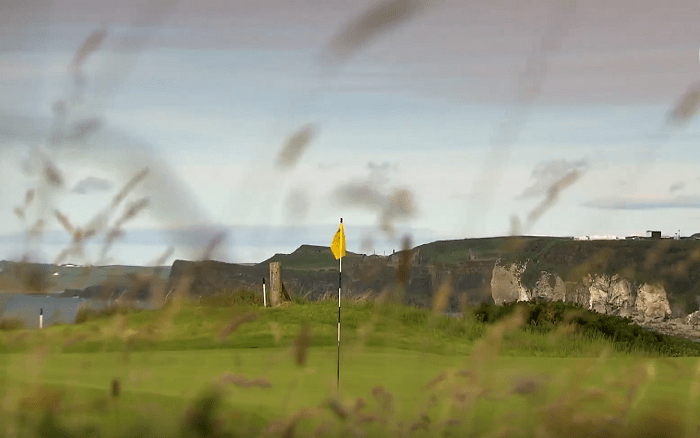 Royal Portrush – readying itself to wow everyone next July. There’s no doubt, also, that the stars were aligning out in the professional tournament arena as regards Ireland shouldering to the front and centre of the golfing consciousness. Padraig Harrington’s three major successes, followed by Graeme McDowell’s US Open win, Darren Clarke’s Open victory and Rory’s run of four majors gave the island nine majors in a space of seven years. Interest in these players and Irish golf was at an all time high and every one of them used their influence to support and push the idea of the Open’s return to Portrush. They couldn’t have delivered at a better time as regards drawing the eyes of the golfing world Irelandwards. A vital step in the whole process was to host a really large scale event and so it was that the European Tour’s Irish Open came to Portrush in 2012. Attendance figures smashed the all-time records for a European Tour event and the television pictures beamed around the world delivered on every front. A great test awaits the best players next July. What price an Irish winner? Two years later the R&A made the announcement we could only have dreamed of – and here we are, on the cusp of staging the 148th Open Championship at Royal Portrush. To say we’re all beyond excited is an understatement. It has been a mammoth collective effort but there’s no doubt that at the heart of it all is Wilma Erskine, driving the process with tremendous energy, wit, diplomacy and a no-nonsense, can-do attitude. 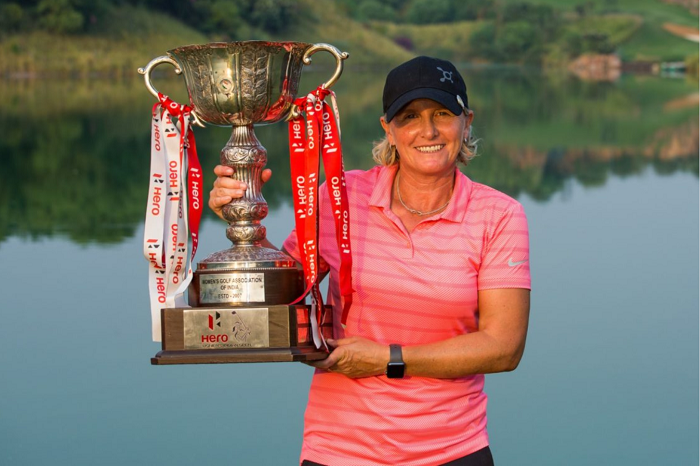 She has quietened the doubters, harnessed the support of the global golf heavyweights, constantly acknowledged and praised her team and pulled it off. She says she plans to retire after the Open – what a legacy she has created, because I’m absolutely sure this won’t be a one-off Open. This is so much more than golf – the R&A tell us that the economic benefit to the host region is £100 million. Mind-boggling stuff. So, as you walk the fairways next July or watch on the telly, roaring on your favourites, you will be witnessing something very special indeed. Whoever wins, you’ll be watching Wilma’s Open.